The IMDB storyline synopsis of HBO’s recent1 documentary ends with the statement, “the film takes a balanced look at this 150-year-old debate.” It appears the film wants to take a balanced look, and they certainly had the opportunity, but if they were trying to achieve a balanced look, they failed miserably. Either the writers are so steeped in anti-Christian evolutionist doctrine that they couldn’t see their own bias, or they willfully withheld important data that is relevant to the discussion. Or perhaps it’s a bit of both. The site is Dissentfromdarwin.org and you can look up all the scientists who dissent yourself. Instead, the picture that is painted is that only fundamental, Bible believing Christians who, as the narrator tells us, “… believe their Bible is the Word of God, the ‘literal truth’ …”2, don’t believe in Darwinian evolution. That only Christians object to Darwin is clearly not the case and so that is a misrepresentation. 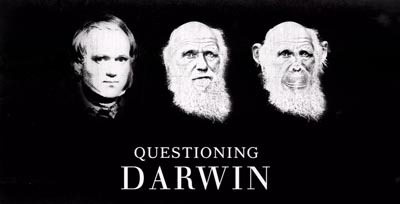 The fact that they have omitted any reference to any scientific objections to Darwin points to what this documentary is really about: questioning Christians who question Darwin. Without speaking to those responsible for this production, one can only speculate as to their motives. But based on what they choose to include (statements from Christians without any investigation as to whether they might be true) and what they chose to omit (objections from scientists who disagree with Darwin’s theory), and the amount of time they spent explaining how Darwin arrived at his theory vs. the amount of time spent showing Christians who “question Darwin,” the motives seems clear: to present Christians as slightly irrational, slightly backwards, science rejecting people whose opinions should not be taken to seriously in this matter. Unfortunately, too often Christians provide ample fodder for this distorted view. For instance, Jesus while standing in the magnificent temple that took 46 years to build is quoted as saying, “Destroy this temple and I will raise it again in three days.” (John 2.19) This was clearly misunderstood by his audience, the Jews. (As it would be by anyone in that context who didn’t know Jesus.) Thankfully John, the writer of the gospel explains what he meant – that he was referring to his body. So Jesus was in essence saying if you kill me, I will physically raise this body and make it live again in 3 days, which is proof of my claims. A prediction and a promise he made good on that first Easter Sunday by his resurrection from the dead. So I understand the pastor to be underscoring the importance of working out apparent contradictions – though he chose, in my estimation, a poor example to illustrate the point. Arithmetic statements by nature and design leave little room for interpretation; and as such don’t illustrate the broad (though clear) range of meaning that verbal statements may convey, particularly when set in various contexts. So while his point is valid, it was used by this production to stereotype Christians as following blindly without a rational basis. As I state in What is Rational Faith Part 2, Christian Faith does not require a blind leap of faith. You won’t see any of the counter arguments to Darwin in this documentary however. In fact to the contrary, Darwin is presented as a hard working, state of the art (even if it is 19th century art) scientist who worked tirelessly to gather evidence for his theory. We are told of all the specimens he examined and the correspondences he had with other scientists. Darwin no doubt considered himself an objective researcher. (We’re supposed to believe that too.) We’re led to believe that his conclusions were valid based on all the research he did, however the documentary never bothers to mention or even question if the research that he conducted supported the conclusions he jumped to. The evidence suggests his research did not support his conclusions. The documentary makes clear however that he suffered greatly at the loss of his favored daughter Annie, and couldn’t understand why there should be evil in the world. Outspoken creationist, Ken Ham, president of Answers in Genesis graciously offers that if his theology professors had told him the source of evil was sin – not God, it may have changed his perspective. What is more likely the case, (since as the documentary tells us, Darwin once intended to be a clergyman) is that Darwin knew what the Bible said about the cause of evil, but didn’t care. It appears Darwin was determined to reject God in spite of the Bible’s explanation of evil in the world.